Slowly but surely, more apps are bringing in support for the MacBook Pro’s Touch Bar, and the latest big name piece of software to do so is Chrome – at least in the Canary (effectively the earliest release or alpha) version of the web browser. The fact that support is in the initial Canary build of Chrome 58 now means that it should be in Google’s browser when version 58 hits its full (stable) release to all and sundry; that should be in the last week of April, going by the current release roadmap. 9 to 5 Mac spotted this development, and noted that obviously enough, Touch Bar support is rather rudimentary in this initial incarnation. 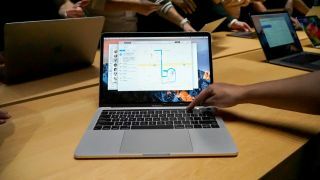 It allows you to pull off tricks like searching directly from the Touch Bar, or launching a new tab, along with the expected collection of buttons (back, forwards, refresh page, add to favorites). But at this point, all the buttons are static, so they don’t change when you add a new tab, and the likes of media playback controls aren’t provided when you fire up a video clip. All this functionality will, of course, be coming before support is brought to the full version of Google’s browser. If you want to try out the Touch Bar with the Canary build of Chrome, you can bag it here, but bear in mind it’s designed purely for early adopters, and can be very prone to bugs or even falling over completely. The list of heavyweight apps which support the Touch Bar now includes Adobe Photoshop, Apple’s own Final Cut Pro and Logic Pro X, along with Spotify, and most recently Microsoft Office. Or alternatively, you can use it as a tiny piano.